Family cruise vacation has been the fastest growing sector in the cruise industry in recent years. Estimated over 20 million people every year choose cruise holiday and of those around 2 million are children and teenagers. As more and more families take to cruises, the time during school holiday has become a peak period on those ships / routes favored by families. Most cruise ships have limited number of cabins that can accommodate families and therefore have to limit the total number of children per sailing. Except those that are especially designed and built with families in mind, like the Disney cruise ships are. This increased demand for family cruise vacation means the cruise lines have been outdoing themselves in order to attract more and more families to the cruise market, and not least to their cruise ships. You will find family friendly amenities and programs on most cruise liners, and choose between increasingly innovative family adventure travel experiences. Facilities like swimming pools and sports courts, outdoor movies, live entertainment, educational centers, video arcades, etc. are almost standard facilities now on all major cruise ships. The cruise lines therefore compete by offering something different to their families, like water coaster (think rollercoaster at sea), ice-skating rings, rock-climbing walls, planetariums, etc. All this has helped making family cruise vacation such a popular choice as it is these days. 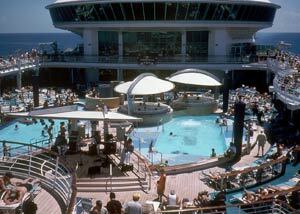 Cruise ships offer safe and controlled environment for your family adventure travel vacation. The kids can wander around the ship freely without you having to worry about them getting lost. The kids can (and almost certainly will want to) participate in various kids clubs, meaning the adults can have some time to themselves, knowing the kids are being looked after and entertained by professionals. Family cruise vacation is also a great option for the extended family, as all age groups should be able to enjoy their cruise holiday. Many grandparents take their grandchildren on a family cruise travel, or join their grownup children with their families. If siblings are travelling together with their offspring's, kids in same age group might enjoy being in a cabin together. However, the kids are always the VIP passengers in any family cruise vacation. The cruise liner priority is therefore to keep them occupied and happy. Child friendly amenities and programs means your kids will have good time throughout the cruise and have the opportunity to make new friends... which is all in the recipe for successful family holiday. Cruise means also all inclusive family vacations, i.e. the fare includes accommodation, dining, entertainment, character experiences and wide range of selected onboard activities. This makes it easier to stay within your holiday budget. There are though some exceptions to every all inclusive family vacations, like some onboard activities, optional shore excursions, souvenirs, etc. Do not forget to budget for those extras as they can add up quickly if you are not careful. Different age groups have different holiday needs so the age of your children is the first thing you should have in mind when choosing your family cruise. Cruise ships also offer different activities for different age groups, and most are better in some age groups than others. There is no age group excluded from a family cruise holiday. If you are up to it you can take your infant with you (actually healthy infants tend to be excellent travelers). You might however want to choose a cruise ship that offers proper nursery and babysitting facilities for young children, e.g. like the Disney Cruise Ships do. 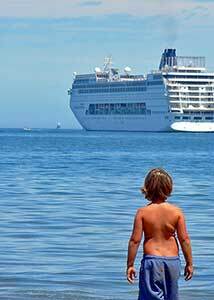 Some family cruise travel specialists consider children under the age of 12 to get most out of a cruise holidays. There are however cruise ships that focus on older kids and teenagers, providing great holiday experience for those age groups. Smaller cruises can also suit some families better than the larger cruise ships. One of the most important things is to choose the right ship for your family cruise. First, make sure the onboard amnesties and kids programs are suitable for your children age. That is not enough though, you must also make sure what is on offer is in line with your children interests. For example, if you kids like sports activities you might want to concentrate on what sports facilities are available rather the live entertainment. The same applies if you kids like arts and crafts, then look for onboard programs that allow their artistic juices to flow. If you are travelling outside peak periods then some cruise lines might not have enough number of children onboard to operate full children programs. This is especially likely to be true of the less family oriented cruise ships. Lack of suitable children programs or activities can lead to boredom and bad behavior so always check the availability before making your booking. It is one thing to keep the kids occupied onboard. Making sure they enjoy the land excursions is another. The combination of sun, sea and sand tends to be something all family members can enjoy. Making Caribbean cruises the most obvious choice for family cruises. Alaska Cruises have also become increasingly popular choice by families, especially by families with older children. There are however other cruises available that can be great choice for some families. Like wildlife adventures in the Galapagos Islands or cultural cruise in the Mediterranean. 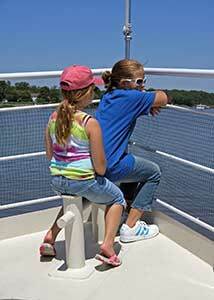 The kids are maybe the VIP passengers on any family cruise vacation but do not forget about you. It is important that the adults enjoy the cruise as well, cruises are the ultimate all inclusive family vacations after all. Most cruise lines appreciate that all family members must enjoy themselves and that most adults want some adult time, even during their family vacation. You will find some adults only areas on most cruise ships now a day, e.g. fitness center, spa, dedicated swimming pool and restaurants and bars. What is the best cruise for families is obviously a matter of taste. Not all families share the same interests even though they have children of same age. Some cruise lines however target families more than others do. Best Cruise Lines For Family Cruise Vacation provides overview of the cruise lines that are normally considered great choice for family cruise vacation.